"You've got to shine," says Tony Blue, a woodcrafter's helper working for the Architect of the Capitol (AOC) through a partnership with So Others Might Eat (SOME). "That's what our SOME instructor told us — be on your best, do your best and always try to learn something different." So Others Might Eat is a D.C. based organization that provides comprehensive, holistic support to D.C. citizens who are homeless and poor. While many people know it for providing meals — and it does serve 1,000 meals a day — SOME also has a Center for Employment Training whose mission is to "empower people out of homelessness and poverty and into living wage careers through marketable skills training, human development, basic education and job development." AOC's Senate Superintendent Takis Tzamaras says, "Beside finding the program inspirational, we believe that it is a good opportunity to hire trained, competent staff to support the election year moves, while allowing us to help some of our neighbors here in the nation's capital. If we can offer them an opportunity to succeed and they help with our Senate moves, what could be better?" One of the two courses of study in the Center for Employment Training is the Building Maintenance Service Technician program. These students learn carpentry, electrical engineering, plumbing, HVAC and safety standards, but their education goes beyond that. Melvin Wells, a SOME graduate working in the Senate Day Labor Division says, "Every interview that we've done in class, I've done: Skype interview, phone interview, one-on-one, conference — but that's not all." As he continues, his SOME colleagues say with him: "They don't just teach you how to get a job; they teach you how to keep a job." Center for Employment Training Director Emily Price said in a recent interview that this is the essential lesson for SOME students. "We focus not just on getting a job, but building a career, and we know that doesn't just happen in six months." 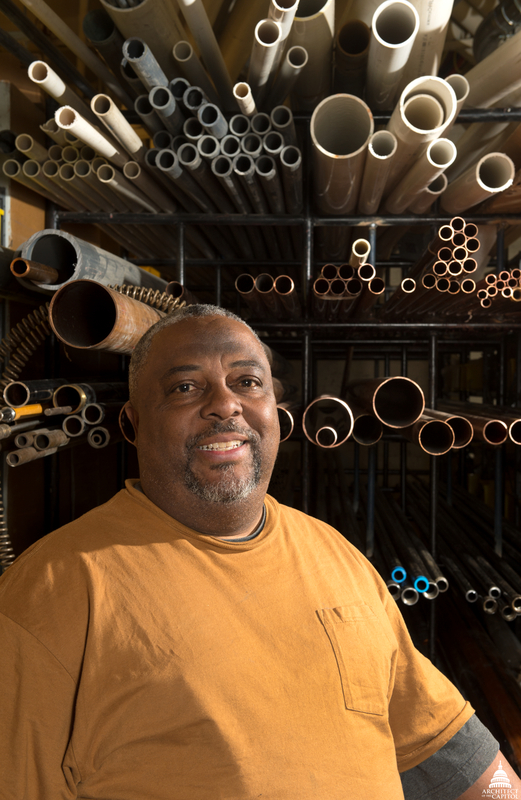 Gary Fauntleroy, a plumber's helper from SOME, says that just knowing he has the possibility to build a career makes all the difference. "The sky's the limit. Now that I'm on the inside looking out, I see that I've got choices, and I feel confident in myself." During their time here at the Architect of the Capitol, the SOME graduates have continued learning, including learning a new way to work. 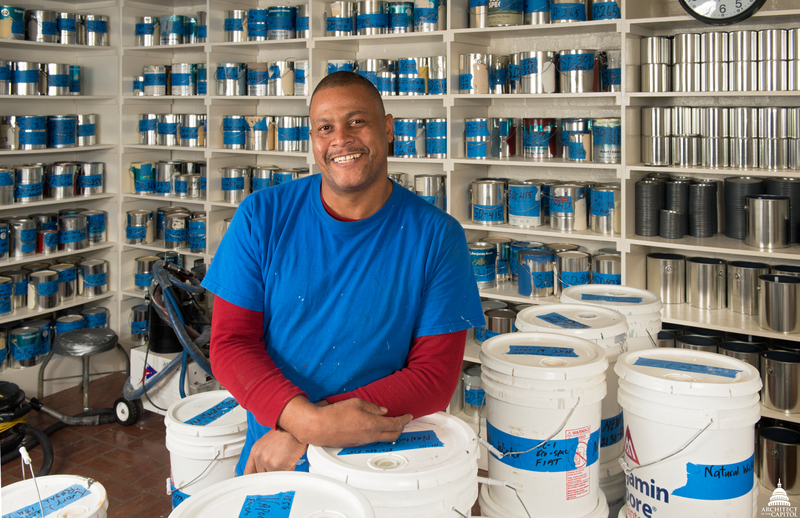 "The AOC works hard and smart," says Ralph Zollicoffer, a painter's helper. Despite the hard work, he says, "It's fun. Everybody's working together, instead of you by yourself doing your job — somebody's always with you to explain it." "In the construction trade, everybody's worried about their bottom line, their deadline, they're not worrying about what you have to do," Wells adds. "But here, we work together." The youngest in his class at SOME, Sean Bridges, an electrician's helper, appreciates all of the support as he starts his career here. "They teach me; they show me how to do things, and they trust me to get them done by myself after they've showed me, so they can go somewhere else and work while I'm working." Through SOME and AOC, all five of these men have also been able to expand on the technical skills it takes to continue their career growth. Wells observed that classes were "kind of rough in the beginning, because the things I thought I knew about building maintenance, I really didn't know as much as I thought I did." 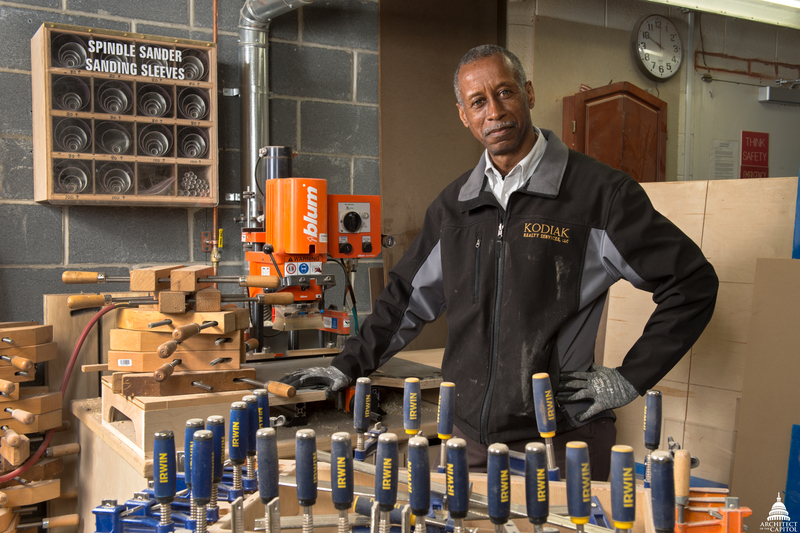 Zollicoffer nods his head, agreeing, "I thought I knew a little bit about building maintenance — carpentry, plumbing, a little bit of everything, all of it. And when I got there, I came to find out I didn't know anything. At SOME, they showed me the right way how to do what was shown to me, which was just the shortcuts." Bridges had been a firefighter before getting his start in electrical at SOME. "I'd love to stay at the AOC, but if that's not possible, SOME has given me what I need to get a job somewhere else and a good start toward starting something of my own, if I want to. And I can still keep up the firefighting with any of those." Even for those who had certified skills, there were opportunities for growth. Fauntleroy says, "I had my plumber's license and really wanted to get into heating, ventilation and air conditioning [HVAC]. I got my HVAC 608 license through SOME, and I was able to work with an HVAC guy during my 'externship.'" Center Director Price said that Fauntleroy's situation is becoming the norm in the recent economic downturn. "The individuals who are applying for the program are so much more skilled than they used to be, but they're just not enough to be competitive in the marketplace, and they're going back for more skills and more training." The support from SOME goes beyond even the extensive technical training. "After they graduate, we track them for a year in the alumni program to make sure that they're moving forward on the steps that they need for their career ladder and professional growth," Price says. The need to continue developing skills has certainly resonated with the SOME employees at the Architect of the Capitol. Tony Blue's supervisor, James Atkins, recalls Blue asking him if forklift training was available. "I told him that, unfortunately, we can't provide training for temporary employees." Tony Blue credits “consistent persistence” with his continued progress through SOME and at AOC. Blue continues the story: "I told him, 'No mountain high enough.' So I took the next step — I went for it myself and took my money and paid for it." Atkins said that when Blue showed him his OSHA-approved forklift certification he was impressed. "That's the thing about him — he's got initiative. He's dedicated. He's there every day, working hard." For Blue, it all goes back to what his SOME instructor taught him: "Put out your best effort, but don't be so knowledgeable in your own mind that you can't learn something." That's certainly a lesson all of the SOME employees have taken to heart as they join the Architect of the Capitol in serving Congress. This story is also published in the Spring 2013 issue of AOC's Foundations & Perspectives. Hello my name is Renee Watson and I'm a former student of SOME ( So Others Might Eat ) and I'm overwhelmed to see other former students of SOME doing very well. As much as I am on the AOC's website I have never seen this page. I recall Mr. Tony Blue returning to SOME to speak to the students that was about to graduate and he spoke very highly of the AOC and how much he enjoys what he does there as a woodcrafter. I am also glad to see Mrs. Davis the first mason female in position and enjoying what she does there at the AOC as well which has impressed me to continue to apply for open positions also so that I can also become a great asset to the AOC it's my DREAM JOB . After SOME took the students to the Russell Building on on a tour in 2015 that's when I was sold on becoming a employee at the AOC. I want to say to all the former students of SOME keep the good work up and continue to make Mrs. Emily Price , Ms. Nelson , Mr. Murry , Mr. Thomas and the rest of the staff proud.